Jolly Holiday Costume. 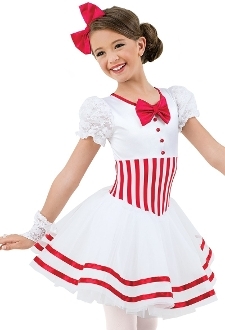 This dress features a stretch satin bodice and lace pouf sleeves with a satin bow at the neckline, shank buttons, a striped poly/spandex waist inset. The tricot skirt is trimmed with ribbon. Attached briefs. Glitter free! Imported. Includes satin hair bow, lace mitts with ruffle. Available in Child XS - Adult XL.